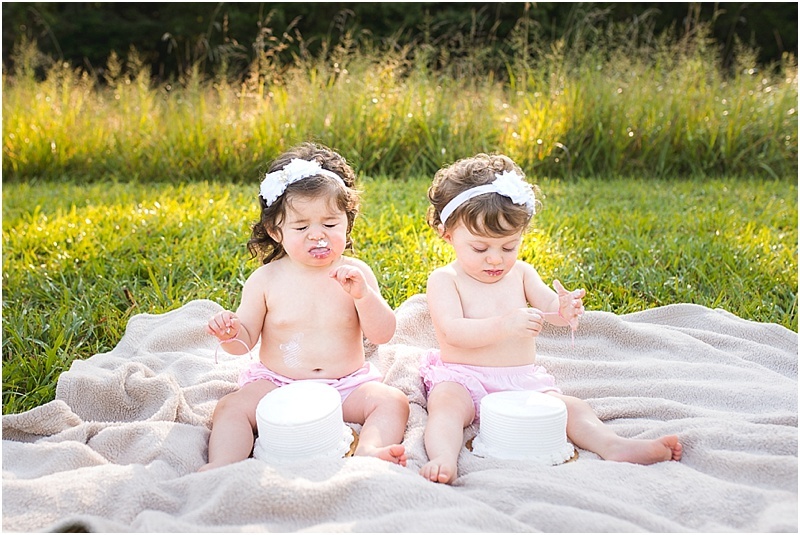 A Double Fun Twin 1st Birthday Session | Northern VA photographer — Northern VA Newborn, Maternity, and Family Photographer serving Ashburn, Leesburg, Purcellville, & Loudoun Co.
First birthdays are so special, aren't they? They're such a huge milestone! Turning one marks the end of babyhood and the beginnings of becoming a toddler. It's incredibly nostalgic to think back one year to the birth of your child. I personally think it is completely insane how much babies grow and change in just one short year. How does that happen right before your eyes?? Now times that times two and that's how Londyn and Wren's mom and dad feel!! 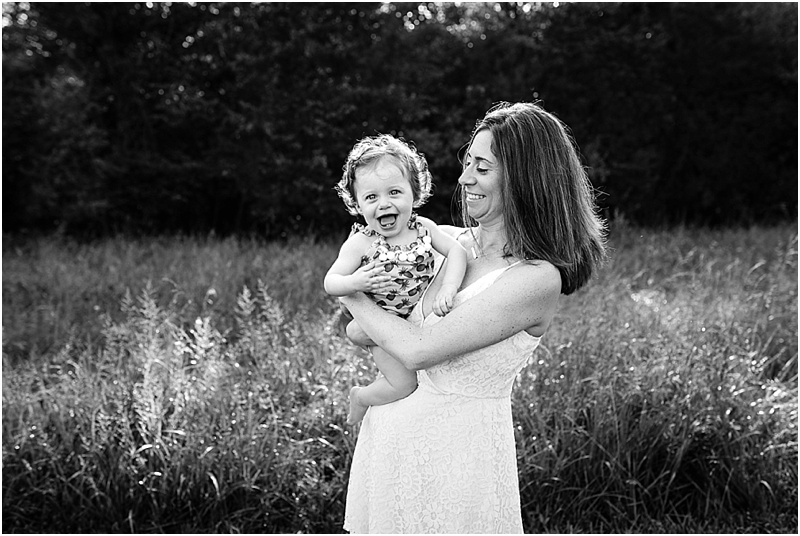 I love doing first birthday sessions for my lifestyle newborn clients! It is a really cool way to come full circle! I love going back to their newborn galleries and seeing how those teeny tiny features have grown. 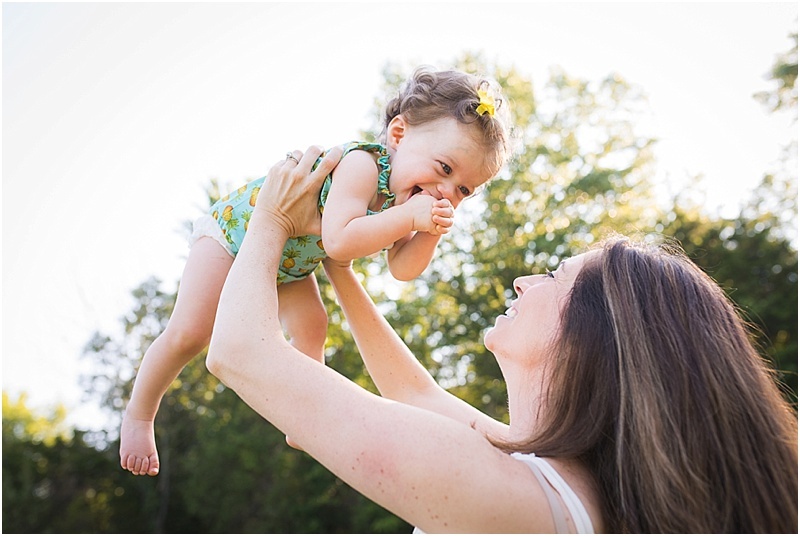 A lot of times, parents will say that the little personality that they show me during their newborn session has persisted throughout the year. Chill babies stay pretty chill. Expressive babies keep showing those endearing expressions. Sensitive babies are still needing mom and dad just as much, just in a different way. In the great nature vs. nurture debate, I'd say that being a newborn and child photographer has given me a great deal of evidence to argue that a lot of our personalities comes from the 'nature' side of what we are born with. According to mom and dad little Londyn and Wren's personalities are pretty different from each other and that has been evident since birth! They predict that they will be the best of friends, but will also have their sibling rivalry moments along the way. They celebrated their birthday with a flamingo and pineapple themed birthday party, so their mom, Nora, wanted to incorporate some of that into the session by dressing them in the cutest little rompers that matched the theme. In fact, she had the party in mind as she was booking so that she would be able to use some of the images from their gallery as decorations for the party. What a great idea! 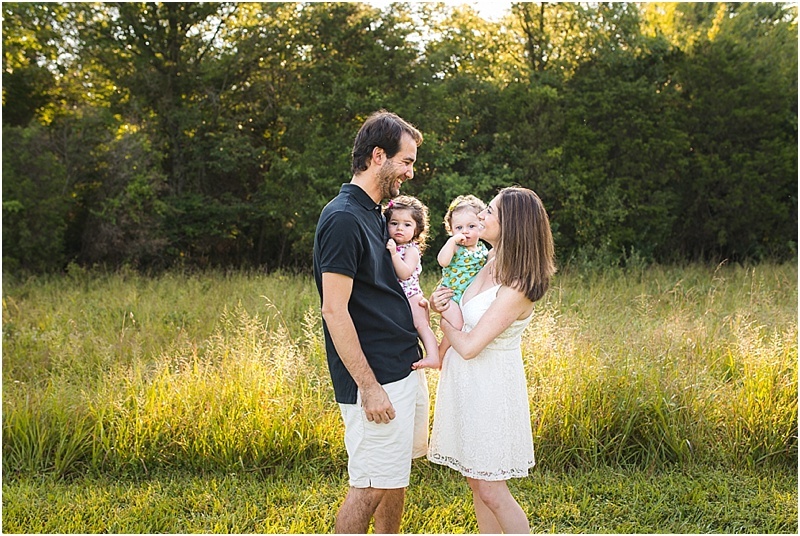 The girls and their parents met me at Claude Moore Park in Sterling, VA for a sunrise session and we were rewarded with beautiful light and perfect temperatures despite it being in the middle of summer. They aren't quite walking yet, but seem pretty close! 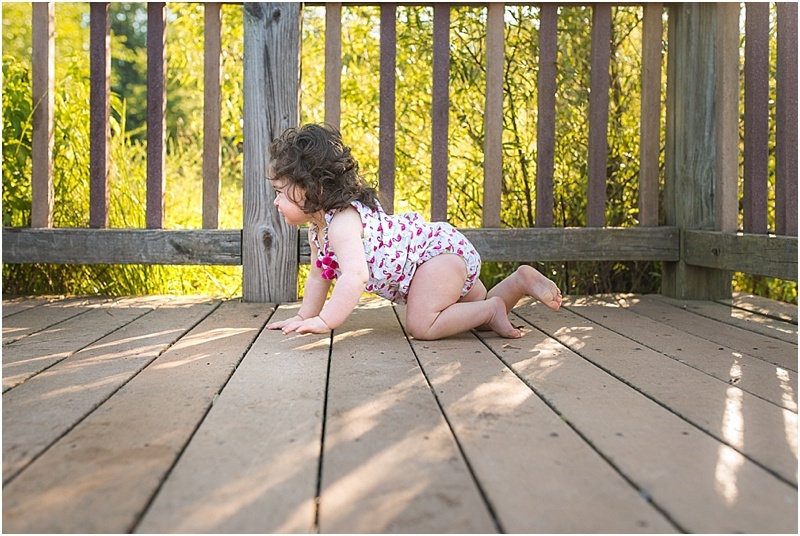 Both girls loved to crawl around and explore...as long as they didn't have to get on the grass! I loved that mom and dad came ready to be in some of the photographs because I think that their interactions with each other are still such a special part of this age. It was very cool to watch how much of a team Rocky and Nora are. You have to be when you are a twin parent! Sheesh, I am just trying to keep up with my little Hudson most days so I can't even imagine doubling it! We ended the session with a cake smash. 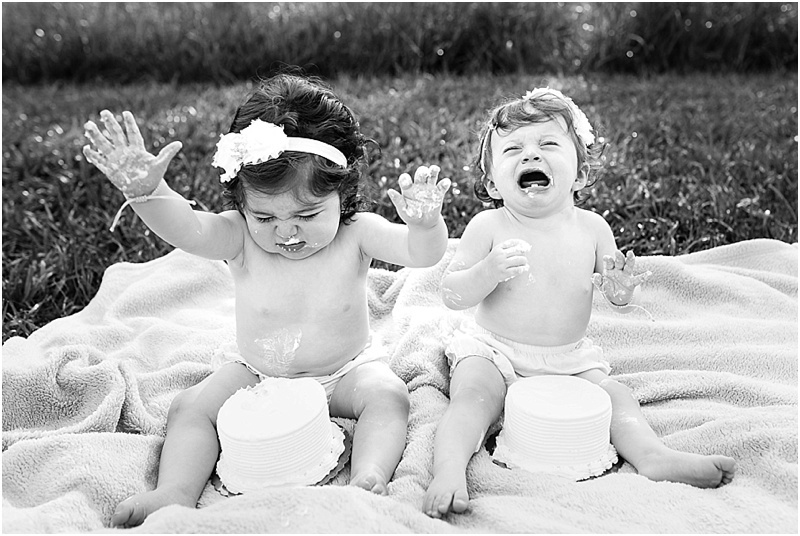 Every one year old reacts differently when they are given their first cake. Some are freaked out by the texture of the icing, while others go to town with reckless abandon. Wren and Londyn were such ladies. They got a little messy, but mostly just daintily touched the icing to their cute little mouths. By the end though, they were totally over it and were ready to be wiped up. I wish I had that kind of restraint when a piece of cake is in front of me haha!! I loved spending a gorgeous morning capturing this special time for Rocky and Nora. May you all enjoy many more beautiful moments in the coming year! I can only imagine what kinds of 'double trouble' this year will bring!